Anyone who plays golf for example, will know that the slightest change in your grip or swing can have a dramatic impact on where the ball ends up.Think of the Qantas – Change for Good program which has raised over $30 million dollars for UNICEF over 23 years! 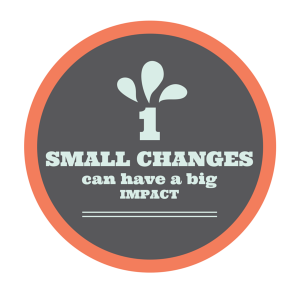 Small changes over time — add up. This is great news. It means that insights and ideas can be transferred from one business to another. You can now learn from and adapt what works from other situations easily and quickly. Small Wins Innovation is built around a 5 step process. This means that it can be learned and applied by any size business or organisation — quickly. The Small Wins Innovation process makes it easier to break down those big hairy goals into bite-size chunks.It also means that it is easier to make progress — one win at a time. You can never tell in advance which small wins initiative will take off. Earth Hour for example, started in one city with a small symbolic turning off the lights for 1 hour. It is now in 162 countries and has become the world’s largest mass participation event.This is why the Small Wins Way concept is such an exciting approach for any size organisation. You never know which bite-size change might just be the next big idea!